Boeing’s proposed fixed-wing aircraft, which could carry 100 or more passengers, has rotors on the wingtips that can be positioned like helicopter blades for take-off and landing, yet rotate around to become propellers in flight. 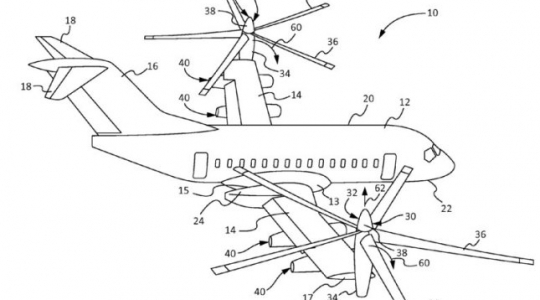 The filing cabinet of futuristic ideas that is the U.S. Patent Office this week logged a new entry from Boeing: a tilt-rotor, vertical-lift commercial airplane that in one version carries at least 100 passengers. It’s a fixed-wing aircraft with rotors on the wingtips that can be positioned like helicopter blades for take-off and landing, yet rotate around to become propellers in flight. The idea is that it can fly fast over long distances, like an airplane, yet take off and land vertically at either end, like a helicopter. You’ve probably heard of the military tilt-rotor, the V-22 Osprey, jointly developed by Bell Helicopter and Boeing — at a cost of almost $13 billion — for the U.S. Marine Corps and Air Force. It’s used, for example, to ferry as many as 24 combat-equipped Marines swiftly from an offshore aircraft carrier into the middle of a ground battle. If the fighting is too intense for a landing, the aircraft can hover as the soldiers rappel to the ground. The Osprey has a controversial safety history. During development and testing, four crashes killed 30 U.S. service members. Since it became operational in 2007, the Osprey has been successfully deployed in combat in Afghanistan, Iraq and in Syria, though eight more people have died in crashes. The new Boeing patent, which names five employees as co-inventors, shows a tilt-rotor with significant differences from the V-22. The proposed civil version features up to four engines powering the tilt-rotors. Those engines are all placed on the fixed wing rather than integrated into the tilt-rotors as on the V-22. Another difference: While the V-22 has a high wing across the top of the fuselage and a twin tail, the patent shows a wing and tail similar to those on a commercial airliner. The inventors argue that placing the engines on the wings makes the tilt rotors lighter so that they require less structural reinforcement. There’s no mention of an option for the passengers to rappel to the ground.